This data set contains three files. The first file provides net primary productivity (NPP) estimates, vegetation characteristics, and summary climate data for 720 globally-distributed terrestrial sites. Each site is geographically referenced (latitude/longitude) and classified according to biome (i.e., cropland, desert, forest, grassland, Mediterranean, pasture, plantation, savanna, tundra, and wetlands), where known. The data were extracted and synthesized from scientific literature dating from 1869 to 1982. The majority of references were published in the 1960s and 1970s. The second file provides a summary of climate, vegetation type, species, and type for the 720 records. The third file provides the bibliography of 858 original-source references of data on NPP from Esser et al. (1997). Literature that is not directly cross-referenced to the NPP data set records is marked with an asterisk (*). Of the 720 unique NPP records, about two-thirds have above-ground net primary production (ANPP) estimates that range between 1 and 8,530 g/m2/year dry matter, one-fourth of the sites have estimates for below-ground NPP that range between 0 and 5,828 g/m2/year, and more than half of the sites have total NPP estimates that range from 3 to 9,320 g/m2/year dry matter. The high-range estimates are lower when doubtful values, wetlands estimates, and estimates for crops/pastures and other managed systems are excluded from calculations. The NPP data collection contains field measurements of biomass, estimated NPP, and climate data for terrestrial grassland, tropical forest, temperate forest, boreal forest, and tundra sites worldwide. Data were compiled from the published literature for intensively studied and well-documented individual field sites and from a number of previously compiled multi-site, multi-biome data sets of georeferenced NPP estimates. The principal compilation effort (Olson et al., 2001) was sponsored by NASA’s Terrestrial Ecology Program. For more information, please visit the NPP web site at http://daac.ornl.gov/NPP/npp_home.html. Esser, G. 1998. NPP Multi-Biome: Global Osnabruck Data, 1937-1981. Data set. Available on-line [http://daac.ornl.gov] from Oak Ridge National Laboratory Distributed Active Archive Center, Oak Ridge, Tennessee, U.S.A. This data set contains three files. One file provides NPP estimates, vegetation characteristics, and summary climate data for 720 globally-distributed terrestrial sites. The second file provides a summary of climate, vegetation type, species, and type for the 720 records. The third file provides the bibliography of 858 original-source references of data on NPP from Esser et al. (1997). 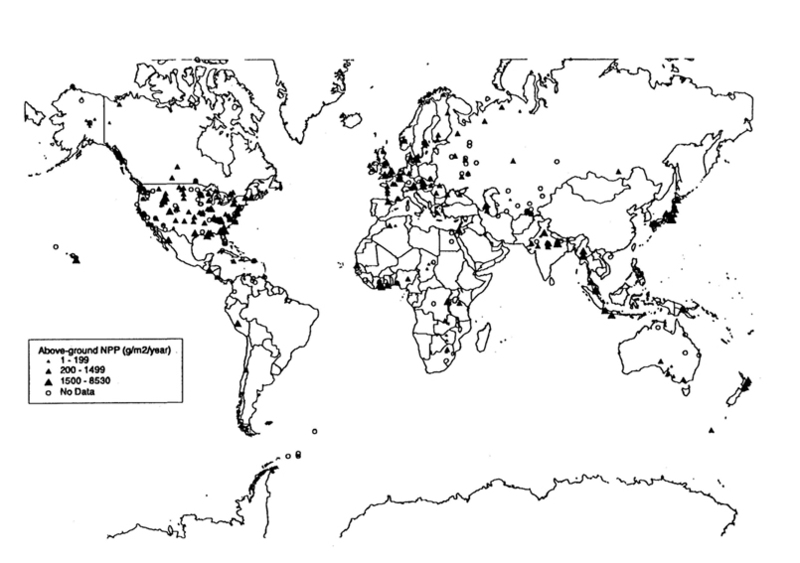 This extensive compilation of field data on NPP of natural and agricultural ecosystems worldwide was synthesized in the 1970s and early 1980s by Prof. H. Lieth, Dr. G. Esser, and others. Much of this work was carried out at the University of Osnabruck, Germany. Although this data set has not been updated since the 1980s, it still represents a wealth of information for use in model development and validation. The 720 single-point estimates of NPP or biomass were extracted from the scientific literature, each with a geographical reference (latitude/longitude). The literature cited dates from 1869 to 1982, with the majority of references from the 1960s and 1970s. Most of the 720 unique NPP records (632, or 88%) have been matched to 356 references from the primary literature. These references ahve been included in a larger bibliography of 858 references. Literature that is not directly cross-referenced to the NPP data set records is marked with an asterisk (*). Each record includes a site identifier, country, author, publication date of original reference, latitude, longitude, NPP estimates [above-ground, below-ground, and total, expressed in grams of dry biomass weight per square meter per year (g/m2/year)], annual average temperature, annual total precipitation, vegetation type, dominant vegetative species, and other variables. A single NPP_C value representing the sum of ANPP and below-ground (BNPP) components, expressed in grams of carbon per square meter per year (gC/m2/year), is also provided. A ratio of 0.475 was used to convert dry biomass weight to carbon content. Where BNPP was not reported in the original source, it was assumed to be equal to ANPP when calculating NPP_C. Of the 720 unique NPP records, about two-thirds have above-ground NPP estimates that range between 1 and 8,530 g/m2/year dry matter (or 2,923 g/m2/year, excluding doubtful values, wetlands, and crops/pastures and other likely managed systems). Similarly, approximately one-fourth of the sites have estimates for BNPP that range between 0 and 5,828 g/m2/year (or 2,040 g/m2/year excluding doubtful values, wetlands, and crops/pastures and other likely managed systems). Total NPP, for which more than half of the sites have estimates, ranges from 3 to 9,320 g/m2/year dry matter (or 3,580 g/m2/year, excluding doubtful values, wetlands, and crops/pastures and other likely managed systems). Note: Based on Table 3 in Esser et al. (1997) which also contains NPP ranges (minimum and maximum) for each biome. NPP estimates for many of the sites in the Osnabruck data set also appear in Clark et al. (2001), DeAngelis et al. (1997), Gower et al. (2012), Olson et al. (2012a, b), and Scurlock and Olson (2012), as well as in individual, site-specific NPP data sets archived at ORNL DAAC [http://daac.ornl.gov/NPP/npp_home.html]. Values may not agree where different calculation methods were used. This data set contains three files. One file provides NPP estimates, vegetation characteristics, and summary climate data for 720 globally-distributed terrestrial sites. The second file provides a summary of climate, vegetation type, species, and soil type for the 720 records. The third file provides the bibliography of 858 original-source references of data on NPP from Esser et al. (1997). The study sites were located in 57 countries, with 42% of the sites located in the United States. The geographical position (latitude/longitude) was reported for 679 records, of which 130 (19%) are known with certainty; 263 (39%) are considered reasonable estimates; and 286 (42%) have not been verified. See Table 4 in Esser et al. (1997) for more details. The study sites primarily represent natural systems; however, unusual sites, such as crops, fertilized pastures, very young or very old forest stands, and plantations were included (and have been flagged where possible). Latitude, longitude, country, vegetation type, specific vegetation terminology derived from the original data, and other variables are provided for each site. The vegetation type is a generalized biome type (i.e., tundra, forest, Mediterranean, savanna, grassland, desert, wetland, and a number of managed vegetation types including cropland, plantation, and pasture). Table 2 summarizes the distribution of the sites by generalized biome type, indicating that 37% were described as forests of various kinds. A wide variety of plant genera were represented by the sites: out of the sites for which dominant species were given, a limited number of genera predominate (e.g., Picea, Pinus, Quercus, Spartina). Caution is advised in using these biome/vegetation types because they were not defined consistently within the original data sources, and 194 sites lack any vegetation designation. Note: Based on Table 6 in Esser et al. (1997). See original data source for this information. See original data sources for this information. ANPP, BNPP, and TNPP estimates in this data set are based on plant dry matter accumulation, expressed as g/m2/year (dry biomass weight). A single carbon equivalent NPP value (NPP_C) expressed in grams of carbon per square meter per year (gC/m2/year) is also reported for each site. Climate data are expressed as annual total precipitation amounts (mm) and annual average temperature (degrees C). NPP Data. NPP estimates for the global Osnabruck data set are provided in one file in comma-separated-value (csv) format (Table 3). The NPP estimates are presented in order of first author author and year. Missing numerical values are indicated by "-999." Missing text fields are indicated by "na" (not available). ANPP (min and max), BNPP (min and max), and TNPP (min and max) units are expressed in g/m2/year (dry matter weight). A single carbon equivalent NPP value (NPP_C) representing the sum of ANPP and BNPP components, expressed in grams of carbon per square meter per year (gC/m2/year), is provided. A ratio of 0.475 was used to convert dry biomass weight to carbon content. Where BNPP was not reported, it was assumed to be equal to ANPP in the calculation of NPP_C. Each record includes a site identifier, country, author, publication date, latitude, longitude, NPP estimates, vegetation type, and other variables. The vegetation-type field begins with a generalized biome type (including tundra, forest, Mediterranean, savanna, grassland, desert, wetland, and a number of managed vegetation types) and is followed by more specific vegetation terminology derived from the original data source. Caution is advised in using these biome/vegetation types because they were not defined consistently within the original data source, and 194 sites lack any vegetation designation. Climate, Vegetation, Species, and Soil File: A summary of climate, vegetation type, species, and soil type for the 720 records in the global Osnabruck data set. The records are listed in the same order as in the NPP file <ods_npp.csv>. Missing numerical values are indicated by "-99.9" and -9999. Missing text fields are indicated by "N/A" (not available). Bibliography File. A bibliography of 858 original-source references of data on NPP from Esser et al. (1997) is provided in a text file with line breaks between citations. Literature that is not directly cross-referenced to NPP data set records is marked with an asterisk (*). The references can be linked to the site NPP records by the first author combined with the year. The bibliography file contains the full list of authors and complete citation. *Abee, A.; Lavender, D. 1972. Nutrient cycling in throughfall and litterfall in 450-year-old Douglas-fir stands. Research on Coniferous Forest Ecosystems, Portland Oregon, pp. 133-143. *Abouguendia, Z.M. ; Whitman, W.C. 1979. Disappearance of dead plant material in a mixed grass prairie. Oecologia 42, 23-30. This data set represents a wealth of information for use in model development and validation. The data are used by global change modelers to develop and validate models of vegetation-soil-atmosphere interactions within the global carbon cycle and to help calibrate remote sensing of vegetation worldwide. Of the 720 unique data records, about two-thirds have ANPP estimates, approximately one-fourth have estimates for BNPP, and more than half have TNPP estimates. There are 17 records with NPP estimates that are flagged as being questionable for their latitude and climate and 22 sites flagged as irrigated, fertilized, or both. Some of the sites in the data set are agricultural sites, and others may represent natural systems with management treatments such as fertilizer, irrigation, grazing, burning, or thinning. Caution is advised in using the biome/vegetation types in the data set because they were not defined consistently within the original data set and nearly 200 sites lack any vegetation designation. Where possible, uncertainties or unusual treatments have been indicated. Data-checking covered all the records where the primary literature was readily available. Detailed descriptions of the study sites, sampling methods, and the method of estimating NPP are available only in the original literature, and the inclusion of points in this data set is no guarantee that the NPP values are strictly comparable. The data should be regarded as illustrating the range of NPP for natural ecosystems worldwide. Creating a single compilation of NPP data for this large number of sites required certain assumptions and conversions that may not be universally applicable to all sites. ORNL DAAC anticipates that users may find these files useful as an index to select more detailed NPP site data or that they may select a subset of these files for their use. Users of this synthesis are strongly encouraged to review the metadata and more detailed, site-specific data files available for certain sites through the ORNL DAAC [http://daac.ornl.gov/NPP/npp_home.html], or to check the primary literature prior to using these data. Published field data on NPP of natural and agricultural ecosystems worldwide was compiled and synthesized in the 1970s and early 1980s. Much of this work was carried out at the University of Osnabruck, Germany. More than 700 single-point estimates of NPP or biomass were extracted from the scientific literature, each with a geographical reference (latitude/longitude). The literature cited dates from 1869 to 1982, with the majority of references from the 1960s and 1970s. Although this data set has not been updated since the 1980s, it represents a wealth of information for use in model development and validation. Most of the 720 unique NPP records (632, or 88%) have been matched to a bibliography of 356 references from the primary literature. The original form of this bibliography contained many more references than records, including multiple sources for the same author and study, as well as additional references to data on standing biomass, soils, and so forth. Since this is a useful resource in its own right, an edited and corrected compilation of the bibliography (858 references) is available as part of this data set with the cross-references to the NPP records highlighted. Site Selection. The sites primarily represent natural systems; however, unusual sites, such as crops, fertilized pastures, very young or very old forest stands, and plantations were included (and have been flagged where possible). The data set includes NPP data based on measurements collected over the past 100 years by investigators using a variety of methods and algorithms to estimate NPP. The scientific literature considered for inclusion in the data set was selected through a review of collections such as Biological Abstracts, Chemical Abstracts, Agricola, and Current Contents, as well as of a number of textbooks and monographs. Lieth, Esser, and co-workers extracted data predominantly from primary publications, that is, those papers that described the original work. • the use of one of the commonly accepted methods of assessing terrestrial NPP (Whittaker and Marks, 1975). If the geographical coordinates of the experimental site were not included in the original paper, Lieth, Esser et al. selected the coordinates from maps or based them on site descriptions. Operational navigation charts (Defense Mapping Agency Aerospace Center, St. Louis Air Force Base, Missouri 63118, USA) and other regional and local maps were used for this purpose. Although croplands and other intensively used areas were generally left out of the data set, in order to show the total range of NPP within natural and semi-natural vegetation types, there was no general exclusion of anthropogenically influenced sites, and such influences were documented as far as possible. Data Screening. The quality assessment process was performed by Scurlock and Olson and consisted of selecting those records for which complete and consistent information was available on: (1) NPP, (2) latitude/longitude (corresponding to known land masses), (3) biome or vegetation type, and (4) at least one literature reference. The criteria for consistency included the use of common systems of names, units, and so on. Names of countries and other data categories were translated from a mixture of English and German to English only. By sorting and re-sorting the records in order of each variable, it was possible to check for out-of-range values and to crosscheck many suspect records against the original primary literature (or at least against the titles of the primary literature references). In certain cases where the primary literature was readily available (e.g., Ecology, Journal of Ecology, and Oecologia), data, vegetation type, and geographical coordinates were checked more thoroughly. Duplicates or near-duplicates were eliminated at this stage. Sites were re-mapped using Geographical Information System software, and suspect sites that were located in oceans or other unlikely areas were identified. Suspect data were checked against original records and corrected in the database where necessary. During the checking process, it was discovered that the geographical coordinates were originally recorded using two conventions, decimal degrees (ddd.dd) and degrees and minutes (ddd.mm), with no easy way to distinguish the difference. Since all coordinates are now given as decimal degrees to two decimal places (ddd.dd), the maximum potential error for an individual site is 0.39 degrees, assuming that a coordinate was originally recorded as ddd.59 (59 minutes) and then erroneously taken as decimal degrees, instead of converting to its actual decimal equivalent (ddd.98). Many of the records were checked against other compilations of NPP data (DeAngelis et al., 1981; Cannell, 1982), and if matches were found, correct coordinates were entered and flagged as being confirmed. Bibliography. The list of 858 references in the Appendix of Esser et al. (1997) was edited for consistency of citation style. Journal and book titles were checked against citation indexes and major libraries and are given in full where available. Duplicates, errors, and spelling and typographical mistakes were eliminated, as have obvious mismatches between journal volume numbers and years. A number of missing references described in the data set were restored. Cannell, M.G.R. 1982. World Forest Biomass and Primary Production Data. Academic Press, London. 391 pp. DeAngelis, D.L., R.H. Gardner, and H.H. Shugart. 1981. Productivity of forest ecosystems studied during the IBP: the woodlands data set, pp. 567-672. IN: Reichle, D.E. (ed.). Dynamics of Forest Ecosystems. IBP 23. Cambridge University Press. 683 pp. Esser, G., H.F.H. Lieth, J.M.O. Scurlock, and R.J. Olson. 1997. Worldwide Estimates and Bibliography of Net Primary Productivity Derived from Pre-1982 Publications. ORNL Technical Memorandum TM-13485. Oak Ridge National Laboratory, Oak Ridge, Tennessee, U.S.A.
Whittaker, R.H., and P.L. Marks. 1975. Methods of assessing terrestrial productivity, pp.55-118. IN: Lieth, H., and R.H. Whittaker (eds.). Primary Productivity of the Biosphere. Ecological Studies 14. Springer-Verlag, New York and Berlin. 339 pp.